A veteran nanotech scientist invents a genetic therapeutic drug to treat diseases of ageing. Some ideas, such as submarines, airplanes and satellites, have transformed the world. Others, such as cloning a dinosaur from their fossilised remains, have proved to be a distant dream. But at times, fantasies seep into reality. So, what if you were to live a thousand years like King Yayati from the Mahabharata? If nanotechnology scientist V.K. Tripathi is to be believed, it would soon be a reality - well, if not a thousand years, you can, at least, add a few quality years to your life. Resveratrol XAR is a wonder molecule that, according to Tripathi, can alter the genetic code and revitalise cells to ward off chronic age-related diseases. In fact, he claims to have succeeded in what big multinational pharmaceutical companies could not achieve after spending billions of dollars in genetech research. The breakthrough invention - a nanotechnology-based delivery mechanism that significantly increases the absorption of a genetech molecule within the nucleus of cells - had been a big challenge for the scientific community. The molecule delivers resveratrol, which activates the Sirtuin and P53 genes - the master guardian genes inside our cells that suppress tumour formation and have shown therapeutic benefits. This was revealed during clinical studies on about 2,000 patients in India over the past four-five years. The 'wonder' drug is now expected to be commercially launched in India in less than six months by Epigeneris, a cutting-edge, nanotech-based gene research start-up founded three years ago by Tripathi's sons Ashish, a banker, and Amish, the author of the Shiva Trilogy. The venture also has the support of other family members, including son-in-law Himanshu Roy, the former Maharashtra ATS chief and additional director general of police, and Tripathi's third son, Anish, a senior executive at Cyril Amarchand Mangaldas. Epigeneres has also filed for four US patents to create a nanotech platform to administer Resveratrol into the nucleus of cells and modulate appropriate changes in gene expressions. Says Viral Shah, Managing Director, Spectrum Clinical Research, which conducted the human clinical studies and safety trials of the drug: "This molecule is favourably impacting every tissue and organ in the human body." Dr Nitya Anand, the former director of Central Drug Research Institute, who had led a team of doctors to conduct due diligence of Epigeneres, agrees: "The big discovery is not the molecule, but the delivery mechanism as it will allow a great many genetech molecules to be delivered efficiently and in a cost-effective manner." Says Ashish Tripathi, CEO, Epigeneres: "We plan to target nutraceutical markets with plant derived molecules and address the Rx market with synthetic molecules. In six months, we plan to launch prescription- based nutraceutical health supplements targeting diabetes management, infertility in men and women, supplements for liver, kidney and cardiac ailments, as well as energiser sports health supplements." So far, an undisclosed amount has been invested in the company by individuals, including the promoters of Just Dial and Khandelwal Laboratories, a pharma company. 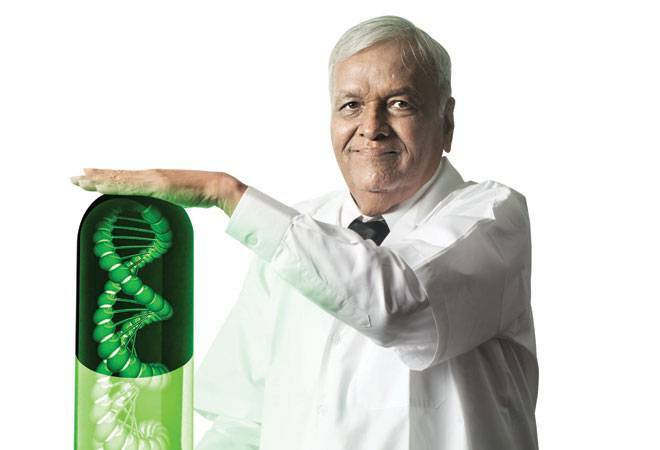 "Our aim is to come up with many more synthetic molecules within the next five to six years," says Tripathi, who is the Chairman of Epigene-res. The company is also working on six molecules for cancer, diabetes, cardiovascular diseases, dementia, Alzheimer's and Parkinson's. Resveratrol, an antioxidant of polyphenols group found in grapes, berries and certain other fruits, activates cellular proteins, or sirtuins, to stimulate longer cell life. It was discovered by a team of scientists led by Dr David Sinclair of Harvard Medical School in 2003. Scientists believed that modulating Sinclair's sirtuins family of genes and P-53 genes could alter the ageing pre-markers, including the stem cell population in the bone marrow, the high-density lipoproteins and insulin levels, to provide a longer and healthy life. The human body has over 70 trillion cells, each with a nucleus containing millions of genes. Every day 50-60 billion cells die and are replaced by new ones. 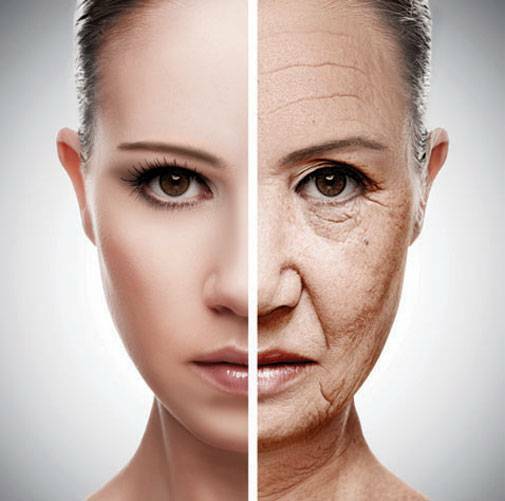 After 25, certain master genes, such as the tumor-killing P-53 and cell life-extending Sirtuin, become dormant, initiating the ageing process. Activitating these genes can suppress diseases like cancer and the onset of ageing. However, despite investing millions of dollars to develop a drug that activates Sirtuin genes, several global pharma majors, including GlaxoSmithKline Pharmaceuticals, which had acquired Sinclair's Sirtris Pharma-ceuticals in 2004, and Pfizer, failed to come up with a marketable drug and, subsequently, the projects were shelved. Tripathi says the biggest challenge was their inability to find a mechanism to deliver the molecule into the nucleus of the cells by penetrating the outer wall nuclear shield that cannot absorb particles bigger than 20 nanometers in diameter. Further, it was not practical to administer it in large quantities, since Resveratrol can become toxic if administered above 1.7 gm at a time, as it was revealed in studies by the US National Health Organization. Tripathi, an engineer and one of the pioneer nanotech scientists in India, had also initiated Resveratrol research in the early 2000s after his parents died of cancer. Finally, in 2012, he succeeded in creating an electrolyte-compatible nanoparticle of Resveratrol, which could penetrate the nuclear shield. Further, the nano-particles were camouflaged into a nano-container so that the lever would not reject the drug. "My research over the years has been successful to administer up to 40,000 nanomoles per litre of blood," says the 75-year-old Tripathi. According to Jo Pisani, Healthcare Strategy Partner, Europe, PWC, gene-tech research companies are attracting huge valuations in the US and Europe, and billions of dollars have been invested by funds and companies to support research. "Gene tech is a relatively new area of cutting-edge research and commercial success may take some more time, though numerous start-ups and companies, worldwide, are putting in lots of money and research into this," she adds. 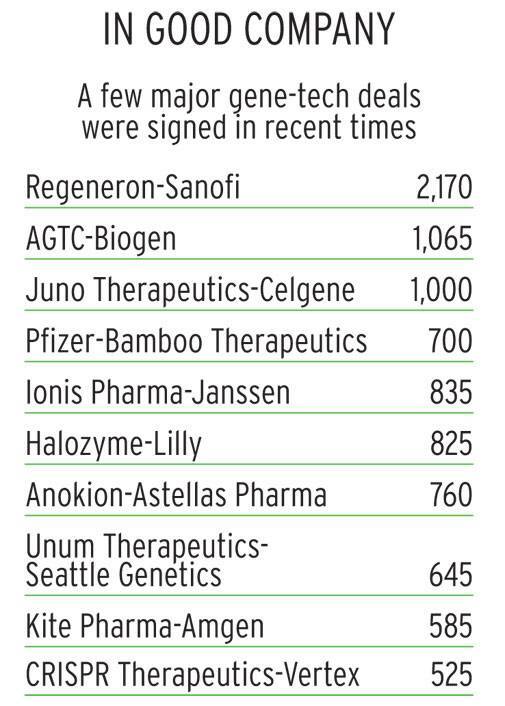 A few weeks ago, Pfizer paid close to $700 million to acquire gene therapy company Bam-boo Therapeutics. Pfizer has a collaboration with Spark for Spark's SPK-FIX Hemophilia B programme. It has also invested in US-based Molecular Therapeutics to develop targeted next-generation gene therapies for cardiac diseases. GlaxoSmithKline has come up with Strimvelis, a gene therapy for the 'bubble boy' disease, and is pricing the treatment at Euro 594,000, or $665,000. US-based gene-therapy cancer-research company Juno Therapeutics made its debut two years ago with a $265-million IPO and is currently valued at over $5 billion. However, the world's first gene therapy, Glybera, which was developed by UniQure in 2012 to treat a rare disease called lipoprotein lipase, could not take off as the treatment was priced at $1 million. "We are aware of the potential and are cautious in raising big money at this moment. Once we have a good pipeline and products are ready to hit the market, we may require big investments," says Ashish. He is in talks with some of the leading investors in the US and West Asia, and a few regulatory organisations, to decide the company's future course of action. "I have not come across any similar patent claims related to what Dr Tripathi has successfully achieved - on how to increase half-life delivery mechanism (retaining the molecule for longer hours in the body), but this can be a big breakthrough in science," says Priyank Gupta, a former pharmaceutical professional and a patent attorney. "The beauty of this technology is that it is a platform play. Given the scope of genetech molecules in the future, Dr Tripathi's technology could help deliver other genetech molecules in a cost-effective manner," says V. Krishnan, the promoter of Just Dial. Unmindful of what the sons are doing to commercialise his inventions, Tripathi is focusing on new research. "Based on this platform, I can invent at least 40 other molecules for various applications across industries in the rest of my lifetime," he says.